Robert Torchia, “Allen Tucker/Bizarre/1928,” American Paintings, 1900–1945, NGA Online Editions, https://purl.org/nga/collection/artobject/52445 (accessed April 23, 2019). Bizarre is part of a series of images of glamorous, stylishly dressed women inspired by artist Allen Tucker’s encounter with the paintings of Vincent van Gogh (Dutch, 1853 - 1890) at the Armory Show—the influential exhibition of European and American modern art held in New York in 1913. The model sits sideways on a chair, rests her hands on its backrest, and turns her head to look directly at the viewer. 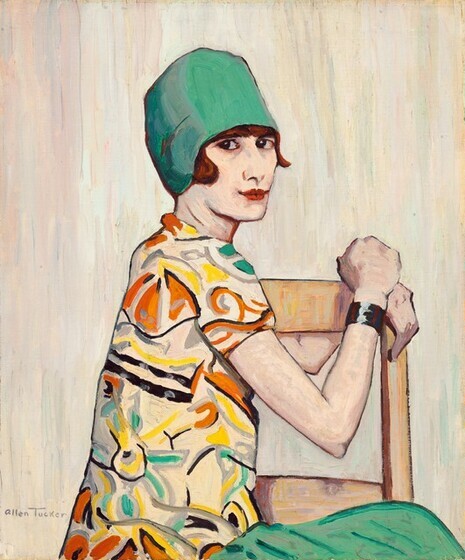 The title of the painting alludes to the sitter’s unconventional pose, intense gaze, and boldly patterned blouse. The flat forms, dark contours, emphasis on decorative surface pattern, heavy impasto, and bold color recall the portraits that Van Gogh painted in Arles and Saint-Rémy in 1888 and 1889. The unusual composition is a leading example of Tucker’s postimpressionist portraits, which update Van Gogh’s style for the roaring twenties in America. John I. H. Baur, Revolution and Tradition in Modern American Art (Cambridge, MA, 1958), 85. Painted while Tucker was a lecturer on composition at the Art Students League, this half-length image of a young, modern woman—the era’s iconic flapper with bobbed hair, cloche hat, and loose-fitting, short-sleeved blouse—is a leading example of the artist’s mature postimpressionist style. The flat forms, dark contours, emphasis on decorative surface pattern, heavy impasto, and bold color recall the portraits that Van Gogh painted in Arles and Saint-Rémy. The work is part of a series of images of glamorous figures, including Bagdad [fig. 1] [fig. 1] Allen Tucker, Bagdad, 1924, oil on canvas, Smithsonian American Art Museum, Gift of the Allen Tucker Memorial, The Soviette (1925), and The Orange Book (undated, The Phillips Collection), that essentially repurpose Van Gogh’s style for the roaring twenties in America. James W. Lane, “Vincent in America: Allen Tucker; Whitney Memorial to a U.S. Post-Impressionist,” Art News 38 (Dec. 16, 1939): 13. rather than likenesses of specific individuals. The artist [1866-1939]; by inheritance to his wife, Mrs. Allen Tucker [1870-1971, née Eufrasia Aguilar Leland Wesson], New York; The Allen Tucker Memorial, New York; gift 1971 to NGA. The Allen Tucker Memorial was established in 1944 by the artist's widow; it was transferred in 1980 to the Art Students League. The Twenties Revisited, Gallery of Modern Art, New York, 1965, unnumbered catalogue. Allen Tucker 1866-1939: Centennial Exhibition, The Milch Galleries, New York, 1966, no. 14. Extended loan for use by John C. Kornblum, U.S. Representative to the Conference and Security Commission of Europe, Vienna, Austria, 1992-1994. Extended loan for use by Samuel Brown, U.S. Representative to the Conference and Security Commission of Europe, Vienna, Austria, 1994-1998. Extended loan for use by Secretary Margaret Spellings, U.S. Department of Education, Washington, D.C., 2005-2008. The infrared examination was conducted using a Santa Barbara Focalplane InSb camera fitted with a J astronomy filter. This sketch is more angular than the painted image and, in general, a bit larger. The head may have been drawn slightly forward of its final painted position. No x-radiographic examination was conducted. Overall the paint is directly applied in flowing brushstrokes that accumulate impasto at their edges. The artist seems to have preferred a clean, sharp line to define his contours, having often reworked back and forth to clarify his edges. Ultraviolet examination indicates that the even, clear, glossy varnish is a synthetic resin. Preliminary pigment identification using fiber optic reflectance spectroscopy finds that the greens are viridian, the orange and yellow are earth pigments, and the white is a combination of zinc and lead. The painting is in excellent condition with no significant paint losses and only a few small brown accretions scattered over the painting. Watson, Forbes. Allen Tucker. New York, 1932: 32-33, repro. American Paintings: An Illustrated Catalogue. National Gallery of Art, Washington, 1980: 251, repro. American Paintings: An Illustrated Catalogue. National Gallery of Art, Washington, 1992: 370, repro. Forbes Watson, Allen Tucker (New York, 1932), 12–13. James W. Lane, “Vincent in America: Allen Tucker; Whitney Memorial to a U.S. Post-Impressionist,” Art News 38 (Dec. 16, 1939): 13. The infrared examination was conducted using a Santa Barbara Focalplane InSb camera fitted with a J astronomy filter.